When your patients are performing a cardiac stress test, it is important for them to follow a few simple steps in order to guarantee their own safety and accurate test results. Gripping the bar of the treadmill too tightly can cause errors in the data. Swinging your arms while a blood pressure measurement is being taken can make it impossible to get an accurate reading. The poster for your stress lab is available in 12 different languages. Select which version you would like on the form and you'll be sent a digital copy for you to print out at your practice. For best results, print the poster on 11x17" paper and laminate it so that it can be cleaned and sanitized. Place it next to your treadmill so your patients have a good reminder of what to do when the blood pressure cuff inflates. 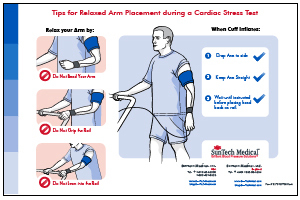 Fill out the form below to receive a free digital copy of the SunTech Medical Stress Lab poster.